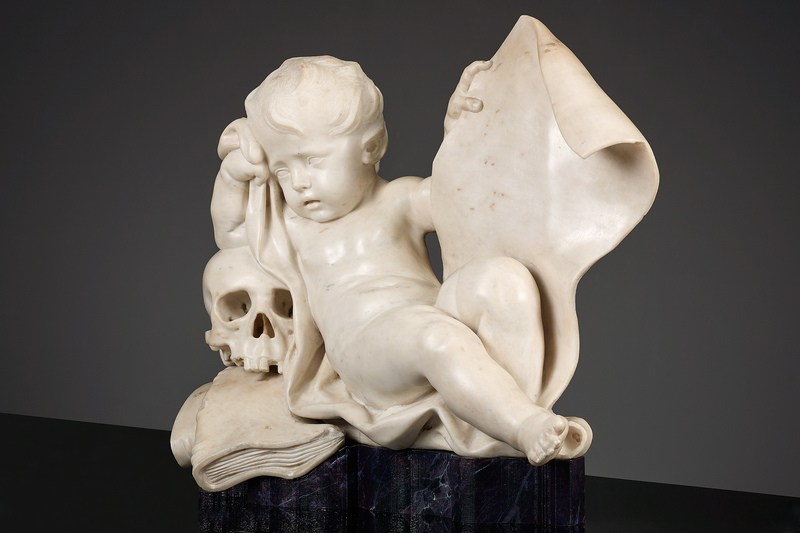 A mourning Putto is lazing on a blanket. His arm rests on a stack of books and a skull. He puts out his other arm holding a scroll. The skull strongly suggests the purpose of this sculpture as part of a tomb or funerary monument, the scroll intended to hold the name of the deceased, a coat of arms, or an appropriate aphorism. This statuette is by the Flemish sculptor Laurent Delvaux. Delvaux is, presumably, trained as a sculptor in his hometown Ghent by the local artist J.B. van Helderberghe. At the age of 18 he moved to Brussels to continue his education with Pierre-Denis Plumier, originating from Antwerp, and to visit the drawing academy. Because of the economical slump of the Southern Netherlands after the Treaty of Utrecht in 1713, many sculptors and artists where lacking commissions. This might very well be the reason of Delvaux’s move to London in 1717 where he teamed up with his fellow countryman Peter Scheemakers. In 1721 they were joined by Plumier to finish a number of sculpted marble funerary monuments, among which the tomb of John Sheffield, duke of Buckingham (1721-1722, London Westminster Abby). After Plumier’s death Delvaux and Scheemakers presumably worked together with Francis Bird on a marble monument for John Holles, 1st duke of Newcastle, also in Westminster Abby. Scheemakers en Delvaux entered into an official partnership and set up a workshop in Milbank, Westminster in 1723. Their company made a large number of frugal classical monuments and garden ornaments inspired by the Antiques. The stock of the workshop was auctioned in 1726 and the couple henceforth moved to Rome in 1728. In Rome, needless to say, Delvaux follows the style of the Classics, and he copies several works. He also studies the work of his fellow countrymen Dequesnoy and Giambologna. From England he is commissioned by John Russell, the 4th duke of Bedford, to conceive some works inspired on the Antiques. Once returned to the Austrian Netherlands in 1733, Delvaux becomes purveyor to the royal household. He received a number of commissions for religious subjects, like the Conversion of Paul in 1736, realized in oak, and now in the collegial church of St. Gertrude in Nivelles. The same church also lodges a series of wooden apostles from the hand of Delvaux made in 1743-44. He also realized a design of Hendrik Frans Verbrugghen for a pulpit in the Sint Baafskatredraal in Ghent. Furthermore, he made a marble funerary monument for the Van der Noot family in 1746 for the church of the Carmelites in Brussels, that nowadays is in the Rijksmuseum Amsterdam. After Prince Charles of Lorraine arrived in Brussels in 1741 as governor-general of the Austrian Netherlands, he gave Delvaux several assignments for decorations of his residences in Brussels, Tervuren, and Mariemont. For the palace in Brussels, Delvaux made allegorical reliefs for the façade and the stairs, and some freestanding sculptures, among which a Hercules, for the base of the stairs. Delvaux also worked for other European courts, like Portugal, and large abbeys like Afflighem, Floreffe, and Villers. In 1734 he settles in Nivelles. Next to his work in marble, Delvaux made many terracotta models of outstanding quality. Among the students of Delvaux were; Gilles-Lambert Godecharle, Pierre-François Godecharle, Pierre-François Le Roy, Laurent Joseph Tamine, Adrien-Joseph Anrion, and Joseph Wilton. The statue of the grieving Putto can be conceived on several moments in Delvaux’s carreer. Possibly in England, where Delvaux made quite some funerary work and his workshop was auctioned of in 1726. The auction catalogue of this occasion, included in the boek by Alain Jacobs, gives no decisive answer on this matter, and the Belgian origin of the statue suggests otherwise. The only funerary monument by Delvaux that is no longer in situ, is that of the Van de Noot family, now in the Rijksmuseum. Of this monument, extensively documented in the 70ies of the last century when it was purchased by the museum, are no design drawings known. This lets us only conjecture what has been part of the constellation. The description of the contract between Van der Noot and the artist reveals, nonetheless, a list of the following ornaments to decorate the tomb: a Pallas of five foot (height), sitting on a weapon-trophy, two children, serving as abutment for the tomb, the height in proportion with the Pallas, and a skull. The last two to be made in white marble. The children and the Pallas are now in the Rijksmuseum. 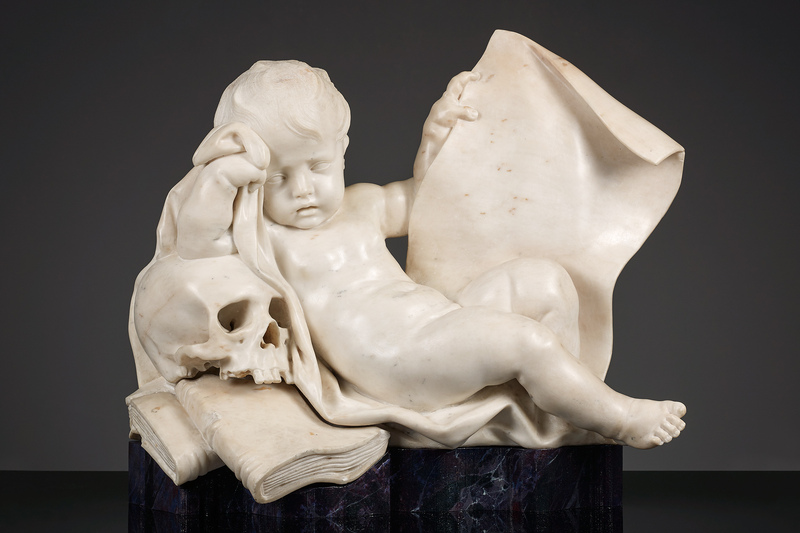 Could it be that the skull-sculpture contained a putto as well, being part of the Van der Noot memorial? The books on which the putto leans are, by all means, an appropriate connection to Pallas, not only goddess of war, but also goddess of wisdom.